Last December, a group of 21 high school juniors and seniors gathered in The Phillips Collection, an art museum in Washington D.C. 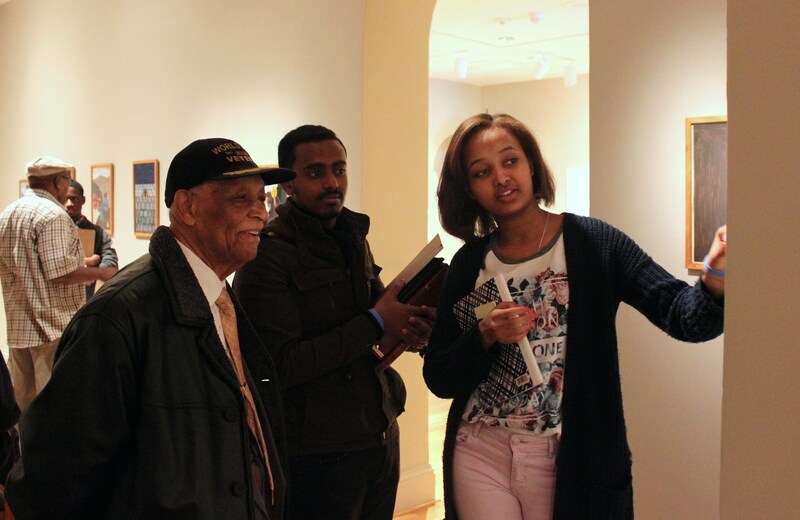 They were viewing The Migration Series by Jacob Lawrence, illustrating the Great Migration during the 1940s, and interviewing Washingtonians from an older generation who lived through the era depicted on the walls. The students were part of a unique afterschool elective called Real World History, created by Cosby Hunt, a former social studies teacher who is now the manager of teaching and learning at Center for Inspired Teaching. Inspired Teaching’s mission is to build a better school experience for students through transformative teacher training. Inspired Teaching encourages staff to come up with ambitious ideas and make them a reality through “radical creativity, structured execution,” one of the organization’s core values. Through a partnership with DC Public Schools, Real World History gives students the chance to explore the past by interning at museums, libraries, and historical sites across Washington. “Students would tell me that it was the first time they felt like they were doing history,” Hunt said of the night at The Phillips Collection. The artworks evoked further memories from their oral history subjects who had been part of the Great Migration, a mass movement of African-Americans from the South to the North from the mid-1900s through the 1960s. The night was a long time in the making. Hunt had ruminated on a way to provide high school students with a more hands-on history experience for about 10 years after coming across a similar idea in A Passion for the Past, a book by history educator Jim Percoco. “As a teacher and native Washingtonian, something continued to nag at me: why wasn’t this sort of opportunity available to the D.C. students who lived and studied surrounded by one of the world’s greatest collection of museums?” Hunt wrote in a blog post about the course. High school students and their oral history subjects view Jacob Lawrence paintings at The Phillips Collection. In 2013, Hunt started taking steps to turn the concept into reality. After convincing 15 museums, libraries, and historical sites to host a high school intern, he went to public schools around the city and pitched the idea to students. Applications filtered in. The course was supported by the City Fund and The Humanities Council of D.C. It also received support from one of 14 LRNG Innovation Challenge grants. The grants grew out of a partnership among the National Writing Project, John Legend’s Show Me Campaign, and the John D. and Catherine T. MacArthur Foundation to help educators advance the principles of Connected Learning. The first semester was also packed with events, seminars, and discussions. Real World History students facilitated an interschool seminar to discuss Ta-Nehisi Coates’ article “The Case for Reparations.” They also met with students from another D.C. high school for a viewing and discussion about the film “Selma,” sharing their thoughts about the Civil Rights movement and the #blacklivesmatter movement. 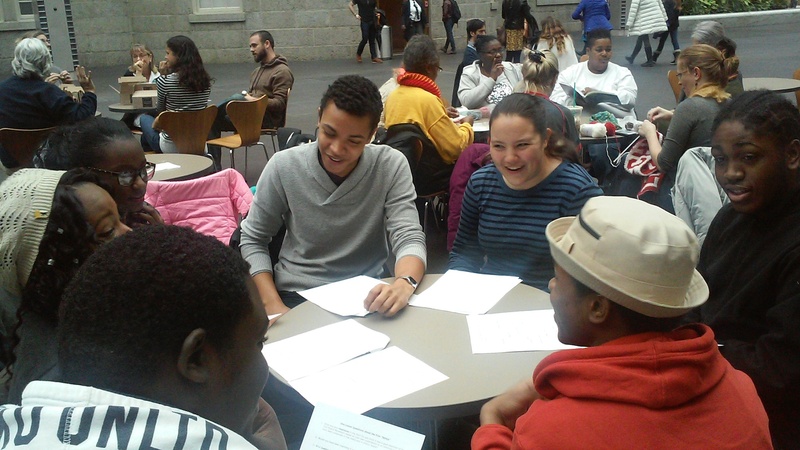 Students discuss the film “Selma” in the National Portrait Gallery. During the second semester, students headed out to their internships. While interning at the Vietnam Veterans Memorial, two young women were tasked with helping visitors find names on the memorial. Another student greeted guests at the Frederick Douglass house. Two other students, who interned at the Library of Congress, won the group documentary award at the 2015 D.C. National History Day for their film on W.E.B. DuBois and the 1900 World’s Fair. The course was not without challenges—Hunt said it is no easy feat to keep tabs on 15 different internship sites at once. But he is taking the lessons of last year’s class to next year’s Real World History course, which currently has 35 students enrolled. Come August, the students are taking a bus to New York City to view the Jacob Lawrence paintings at the Museum of Modern Art. This time, their senior oral history subjects, many in their 80s and 90s, will be traveling with them, leaving more time to learn from each other. Learn more about Center for Inspired Teaching at www.inspiredteaching.org or follow them on Twitter at @InspireTeach.